Despite this, the state company said that the water was potable. A statement released days later said: “In relation to the event of the taste and odor perceived several days ago by the population of the metropolitan area, OSE informs that it was entirely due to a substance released by a type of microscopic algae in the Santa Lucia River. This substance, called Geosmin, has no bearing on the health of the population “. The authorities closed ranks and denied emphatically the contamination of water sources, which had always been of high quality. However, much of the population did not believe the State’s arguments, buying bottled water and depleting stocks. At that time (approximately 2003 – 2008), amid the euphoria of to the rise to power of the Fente Amplio (2004) and an atmosphere of nationalism exacerbated by disputes between environmentalists and the Argentine government, the majority of the population supported the Uruguayan government. Now things have changed. The rural population (only 5% of the total) began to feel the harmful effects of agricultural development and small-scale traditional farmers (including livestock herders) began to mobilize. It’s difficult to accept that Uruguay’s rivers are polluted. The country was always a natural paradise, with few cars and light industry, with extensive ranches and grain farming. But in the last decade, with agricultural and mineral speculation, things have changed drastically. The main changes that have been occurring over the last ten years have been concentrated in rural production. The price of land has increased six fold ($500 to $3,000 per hectare on average). Thirty-eight percent of agricultural land has been sold, and 41% has been leased . Between 2000 and 2008 Uruguayan owners lost 1.8 million hectares that went to corporations that acquired a similar surface quantity. There is a strong concentration of land owned by multinational corporations with one million hectares belonging to just 14 groups. Montes del Plata (Chilean-Swedish-Finnish) has 234,000 hectares followed by Forestal Oriental (Finnish) with 200,000 hectares. The U.S. company, Weyerheuser has 140,000 hectares and the Argentine owned El Tejar and Agronegocios de Plata (ADP) have 140,000 and 100,000 hectares respectively, completing the list of the largest foreign investments. In the 2001-2002 season there were only 29,000 hectares of soybeans planted. In 2012 it exceeded 1 million hectares. Another million hectares of land was forested. This represents an exponential increase in the use of pesticides and fertilizers that have been washed by rain into rivers. This has initiated a drama that the people are beginning to feel. A study of the Santa Lucia River (which provides 60% of the drinking water) conducted by the National Direction of the Environment (DINAMA) resulted in scandal. Internationally accepted phosphorus levels in water are 25 micrograms per liter, but the count detected in the river ranged between 70 and 12,900 micrograms per liter. Scientists and environmentalists have been ringing alarm bells about the pollution, but the state has done little. Biologist Luis Aubriot of the Sciences Department told reporters that “if there is no reduction of nitrogen and phosphorus” then the water problems will not be solved . Another biologist, Mario Calcagno, recalled that in addition to the pesticides and fertilizers used for soybeans, the Santa Lucia River is polluted by refrigerator effluents, food industries and urban centers, and that native forest on its banks have been disappearing. “It’s a disaster,” he said . Diego Martino, who represented Uruguay at the United Nations Program for the Environment, presented one of the strongest arguments: “In 2010, levels of atrazine were detected in the water. It is one of the components of glyphosate. There is no nationwide study that says what the consequences of very low levels of atrazine could be when consumed over ten years “. In his opinion the main problem is the inability of the State to make and regulate decisions. He gave an example: How long did it take for the DINAMA to change the distance of 50 meters to 500 meters for spraying [pesticides] around a rural school? Years”. It’s not known how many children were made ill by this delay. One of the main problems are [agricultural] reservoirs, which are used mostly for irrigation and rice cultivation. In a small country like Uruguay there are over a thousand dams that with the summer heat become incubators for algae growth because of the concentration of agrochemicals. Rain the water in the reservoirs overflows into rivers. All the rivers of Uruguay, including the extremely wide Río de la Plata, are green with pollution. The director of the Institute of Ecology and Environmental Sciences at the Sciences department, Daniel Panario, received in 2012 the National Award for Citizen Excellence. He is the country’s most distinguished and combative scientist that has been denouncing pollution for over 20 years. In his opinion, the best example [of pollution] linked to water is lead. “In the 1940s in England it was concluded that the poor performance of children in schools was due to lead and immediately all the water pipes were changed. In Uruguay this conclusion was made in the 1970s. We are now in 2013 and they have still yet to finish changing out the lead pipes in Montevideo. They say they have other priorities and that it’s expensive”. In addition to the State, the university is an obstacle in allowing the population in knowing the truth. “One does not have complete freedom to investigate issues of national interest. When one goes to talk they risk having to deal with the authorities. A few days ago the [university] president said that I did not speak representing the university and that I was damaging the [image] of the department”. Here appear two problems: academics prioritize research that can be published in journals, usually in English, to which ordinary people do not have access. On the other hand, universities depend on conventions and funds from various international organizations and private companies that have no interest in making public criticisms of the products they sell. Universities themselves often boycott researchers like Panario, despite their national and international recognition. He applied twice for the national research fund and was rejected both times. He had to appeal to higher authorities for admission. He now seems happy with the growth of the movement against open-pit mining. Iron ore prices were stable for twenty years. In 1985 a dry metric ton was worth $26. In 2004 it had reached $38 and climbed to $140 in 2008. In 2009 the price dropped to $101 per ton, but now it’s rising once again. Iron ore is not just any other metal, as it represents 95 percent of all metals used in the industry. Aratirí Mining belongs to Zamin Ferrous, an Indian company based in London. It has seven projects in South America, five in Brazil, one in Peru and one in Uruguay, and expects to produce about 50 million tons of iron ore across the continent in 2013. But the company’s potential in the region amounts to 10 billion tons. In Uruguay they were licensed to mine about 110 thousand hectares in areas devoted to cattle ranching and forestry, where exploratory drilling had been performed to detect areas of greater density of iron ore. The mining project has three parts: the area where the mining will be conducted, about 220 kilometers of pipeline to the Rocha coast and finally a freight terminal. The total investment is estimated to be $2 billion. In late 2010, when Parliament passed the Mining Code, small-scale rural producers of Valentines and Cerro Chato (180 and 3,000 inhabitants each), the areas where Aratirí installed [it’s project], began to mobilize. In January 2011 neighborhood commissions from the coast, where a port will be installed to export the iron, started a petition against the project. From there [opposition] activity intensified. First they attended a session of parliament to explain the reasons for opposing the project. Small-scale livestock ranchers would see disruptions in their production because they will either face land expropriations and thus be forced to emigrate or they will be forced to migrate because of air and water pollution. The coastal villagers would suffer a loss to their fisheries and tourism will become scarce. Later they held dozens of informational events in different places, such as small towns of 50 to 100 people. Finally in May 2011 they convened the first national march in Montevideo with the slogan “No to mining, yes to natural resources”. The [mining] company held its own march in Cerro Chato mobilizing merchants and workers. The next day the [small-scale, opposition] producers doubled the number of people mobilized, challenging the multinational [company] that had also began conducting its own informational events that were boycotted by those opposed to mining. In July 2011 the Confederation of Coastal villages was created with representatives from seven communities of the Rocha Department: La Paloma (pop. 3,500), Aguas Dulces (400), Punta del Diablo (800), Valizas (330), La Pedrera (200), La Esmeralda (57) and Cabo Polonio. These communities oppose the construction of a port in La Paloma designated for the export of wood to be sent to paper factories, and another port designated to export iron. On October 12 the second national march was held with a confluence of collectives from the north, central region, south and coastal zone, made up of small-scale producers and rural workers. Several celebrities participated in a video against mega-mine projects. Since then each region now focuses on local activities and the Permanent National Assembly in Defense of the Land and Natural Assets was created with about 36 grassroots collectives . In mid-2012 the government confirmed the construction of a deepwater port for the export of iron, wood and other products near La Paloma. In August the movement against mining held its first national assembly in Tacuarembó (North) attended by 300 people from 35 collectives. In attendance were three unions, indigenous groups, community radios, small-scale producers and rural workers. Members of the coastal towns opted for direct action to prevent the construction of the port near La Paloma. 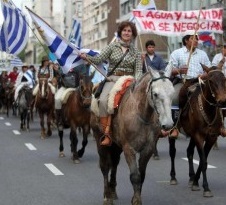 On October 12 the third national march was held in Montevideo with 10 thousand people participating, dozens of gauchos on horseback, tractors, flags of indigenous peoples, environmentalists and unions. The movement against mining in Uruguay has three unprecedented features. The first is that it was born in the rural central region, in villages of about 50 to 3,000 people, and then it appeared in the departmental capitals and later in Montevideo, where the first groups are still being organized. This is a reversal of what has happened throughout the country’s history of social struggles, where almost all have been born in the capital. Secondly, it’s a grassroots, assembly based, horizontal movement, linked to land and territory. It finds its inspiration from rural populist identities rather than unions and labor of the traditional left. Although these sectors are integrated and participate they do not assume a hegemonic role. The speech and language invoke the independence struggle of 200 years ago led by Jose Artigas, also emphasizing that everything relates to the land. “Aguas de marzo. Agroquímicos y potabilidad”, Brecha, March 22, 2013. Santos, Carlos, ?Que protegen las áreas protegidas?, Montevideo, Trilce, 2011. Zibechi, Raúl, Entrevista a Daniel Panario, Montevideo, April 8,2013. All of the information from: Raúl Zibechi, Las penas son de nosotros, work cit. El Observador, April 11, 2013. The Santa Lucía River begins in the center of the country 100 kilometers from Montevideo and connects with la Plata River near the capital. El Observador, April 12, 2012. El Observador, April 4, 2012. Interview with Daniel Panario, work cit. Information taken from MOVUS, Uruguay Mining Observatory and the Permanent Assembly.